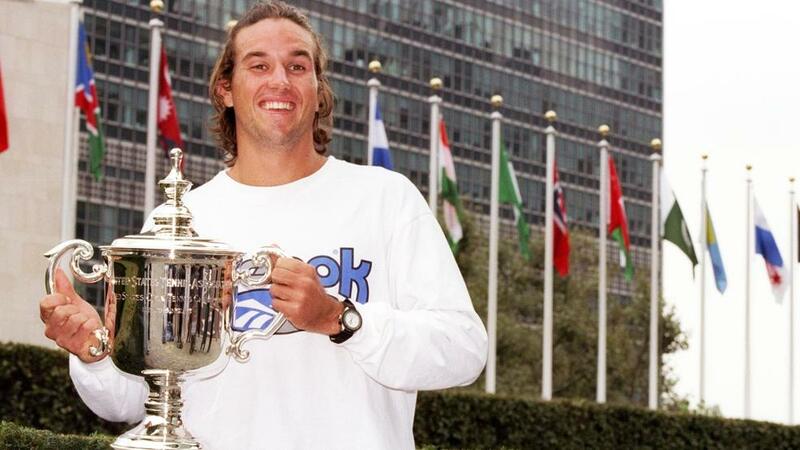 8 Sep 1997: Patrick Rafter holds up the US Open Trophy at the Regal U. N. Plaza Hotel in New York City, New York. It was 18 years ago, on July 26, 1999, when Patrick Rafter - a two-time US Open champion, and one of the most popular players in the sport’s history - became the World No.1 on the ATP World Tour. Having won his first major at the 1997 US Open, beating Greg Rusedski in the final, Rafter’s rise to No.1 came at the end of a stellar 12-month stretch that not only included his second major at the 1998 US Open - where he beat Mark Philippoussis in the final - but also another five titles, including back-to-back Masters 1000s in Canada and Cincinnati in 1998, and winning 63 of 83 matches. And just a few weeks after reaching the 1999 Wimbledon semifinals and winning a pair of Davis Cup matches against Jim Courier and Todd Martin, Rafter rose to No.1, the 17th of now 26 men to achieve the feat and one of three Australians, alongside countrymen John Newcombe and Lleyton Hewitt. There was one thing, though - Rafter only held No.1 for one week. And another thing - his next tournament didn’t come until a week later, meaning he never actually played a match as World No.1. He was asked about the brief stint at the top going into his next tournament. He did spend almost half a year - 24 weeks to be exact - right behind at No.2, though. In the end Rafter finished his career with those two Grand Slam titles at the US Open and two more Grand Slam finals at Wimbledon (2000 to Pete Sampras and 2001 to Goran Ivanisevic). He was inducted into the International Tennis Hall of Fame in 2006. - American legends Pete Sampras and Andre Agassi were right behind him at No.2 and No.3. - Roger Federer was ranked No.106. - Lindsay Davenport was the women’s No.1. - The Sixth Sense was six days from hitting theaters.